Abalone diver John Rudge does not muck around when he enters the domain of the great white shark. When diving near seal colonies, he spends as little time as possible on the surface forming a silhouette to any great whites that might be hunting below. “They are the top of the food chain to us, an absolutely brilliant predator and something to be respected,” he said. Four of his industry colleagues have had encounters in Victorian waters in the past year. “I figure if one comes along, I’ll either see it and have an encounter or I won’t see it and that will be the end of me,” he said. Mr Rudge, a second-generation diver from Mallacoota, and Blairgowrie surfer Kent Stannard are helping the CSIRO place listening devices along the Victorian coastline to track the movements of tagged great white sharks. The abalone industry has a vested interest in knowing more about the seasonal movements of the sharks they share their “office” with. Already the research is paying dividends. Victorian waters appear to be the pupping grounds for the species, along with the Great Australian Bight. Sharks tagged in NSW and South Australia have been tracked using a Bass Strait corridor, travelling as far north as Rockhampton and south to Tasmania. 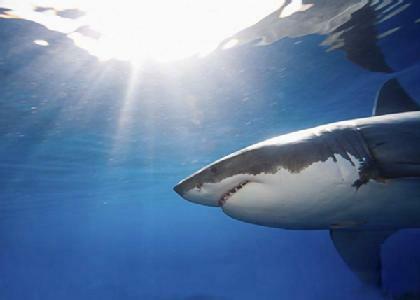 Barry Bruce, Australia’s eminent white shark expert from the CSIRO in Hobart, said satellite tracking and acoustic tags implanted under sharks’ skin were offering a glimpse into a species that had been largely a mystery. “It is incredible how the movements of these animals are linked,” he said. The tracking has helped dispel some myths. Great whites were believed to follow the migration of humpback whales, but they appear to follow the whales’ route only along the east coast of Australia. On the west coast they move in the opposite direction. Great whites were also thought to live at seal colonies, but are only occasional visitors.